Download "MATH 0110 Developmental Math Skills Review, 1 Credit, 3 hours lab"
1 MATH 0110 Developmental Math Skills Review, 1 Credit, 3 hours lab MATH 0110 is established to accommodate students desiring non-course based remediation in developmental mathematics. This structure will best serve students whose assessment score is borderline for an entry course in college level mathematics or a subsequent course in the developmental sequence. The course may be delivered in a traditional or hybrid format, so students must be able to thrive in a self-directed study environment. 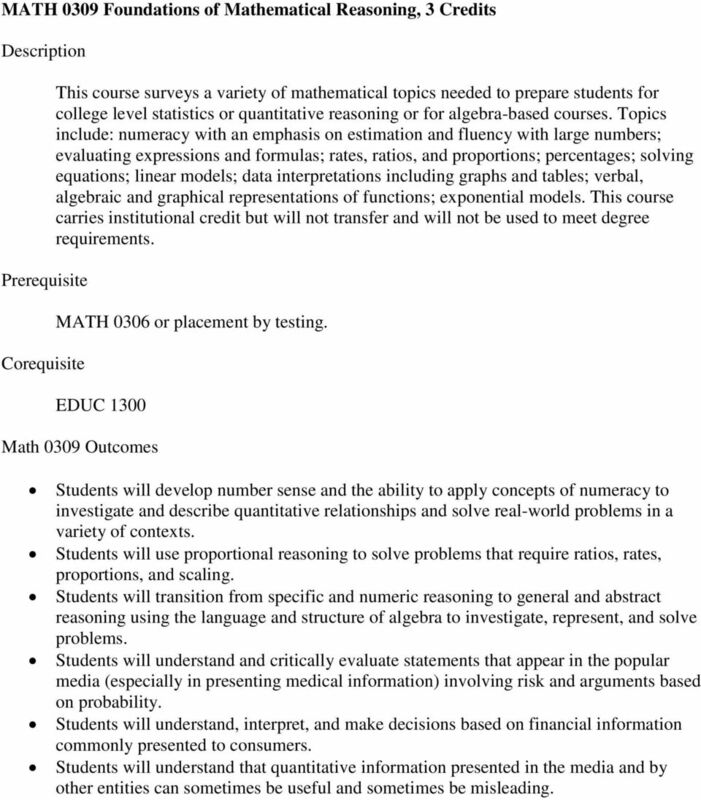 A subset of outcomes for MATH 0306, 0308 and 0310 will be covered in this course, depending on student needs. This course carries institutional credit but will not transfer nor be used to meet degree requirements. 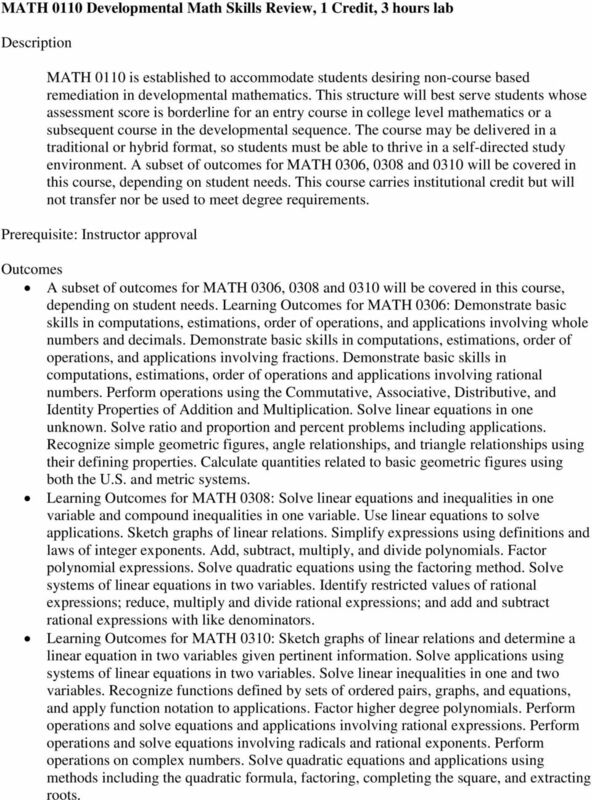 Prerequisite: Instructor approval Outcomes A subset of outcomes for MATH 0306, 0308 and 0310 will be covered in this course, depending on student needs. 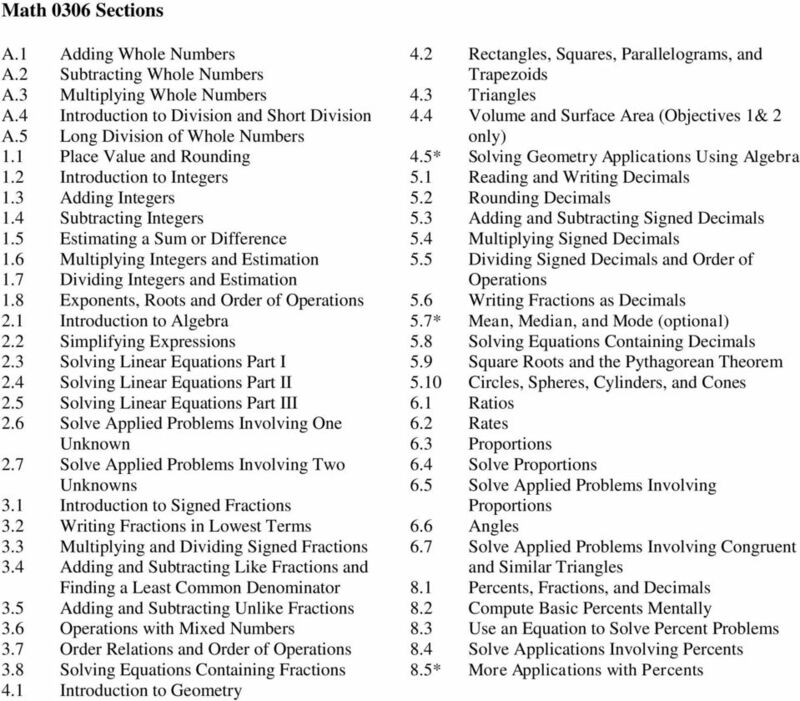 Learning Outcomes for MATH 0306: Demonstrate basic skills in computations, estimations, order of operations, and applications involving whole numbers and decimals. Demonstrate basic skills in computations, estimations, order of operations, and applications involving fractions. Demonstrate basic skills in computations, estimations, order of operations and applications involving rational numbers. Perform operations using the Commutative, Associative, Distributive, and Identity Properties of Addition and Multiplication. Solve linear equations in one unknown. Solve ratio and proportion and percent problems including applications. Recognize simple geometric figures, angle relationships, and triangle relationships using their defining properties. Calculate quantities related to basic geometric figures using both the U.S. and metric systems. Learning Outcomes for MATH 0308: Solve linear equations and inequalities in one variable and compound inequalities in one variable. Use linear equations to solve applications. Sketch graphs of linear relations. Simplify expressions using definitions and laws of integer exponents. Add, subtract, multiply, and divide polynomials. Factor polynomial expressions. Solve quadratic equations using the factoring method. Solve systems of linear equations in two variables. Identify restricted values of rational expressions; reduce, multiply and divide rational expressions; and add and subtract rational expressions with like denominators. Learning Outcomes for MATH 0310: Sketch graphs of linear relations and determine a linear equation in two variables given pertinent information. Solve applications using systems of linear equations in two variables. Solve linear inequalities in one and two variables. Recognize functions defined by sets of ordered pairs, graphs, and equations, and apply function notation to applications. Factor higher degree polynomials. Perform operations and solve equations and applications involving rational expressions. Perform operations and solve equations involving radicals and rational exponents. Perform operations on complex numbers. Solve quadratic equations and applications using methods including the quadratic formula, factoring, completing the square, and extracting roots. 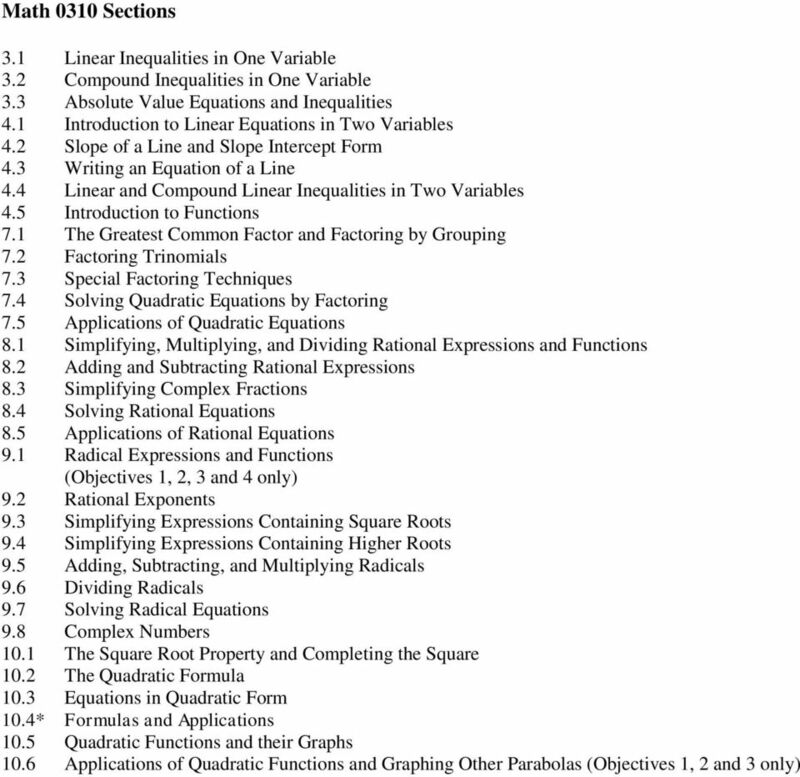 2 MATH 0306 Pre-Algebra Mathematics, 3 Credits Prerequisite Topics for all formats include basic arithmetic operations on integers and rational numbers, order of operations, introduction to basic geometric concepts, simplification of algebraic expressions and techniques of solving simple linear equations. This course carries institutional credit but will not transfer and will not meet degree requirements Placement by testing Textbook for Math 0306 PreAlgebra with P.O.W.E.R. Learning; Sherri Messersmith, Lawrence Perez, Robert S. Feldman Softcover, bundled with ConnectMath access code card, McGraw-Hill Publishing; 1st edition ISBN 13: Math 0306 Outcomes Calculate perimeter and area of quadrilaterals, triangles, and circles. Calculate volume of rectangular solids. Demonstrate basic skills in computations, estimations, order of operations and applications involving rational numbers. Demonstrate basic skills in computations, estimations, order of operations, and applications involving integers. Demonstrate basic skills in computations, estimations, order of operations, and applications involving whole numbers and decimals. Perform operations using the Commutative, Associative, Distributive, and Identity Properties of Addition and Multiplication. Recognize and Calculate angle relationships, and triangle relationships. Solve linear equations in one variable. Solve ratio and proportion and percent problems including applications. 4 MATH 0308 Introductory Algebra, 3 Credits Prerequisite Topics for all formats include basic algebraic operations, solving linear equations and inequalities, laws of integer exponents, factoring, rational expressions, the Cartesian coordinate system, graphing lines, finding equations of lines and solving linear systems. This course carries institutional credit but will not transfer and will not be used to meet degree requirements. 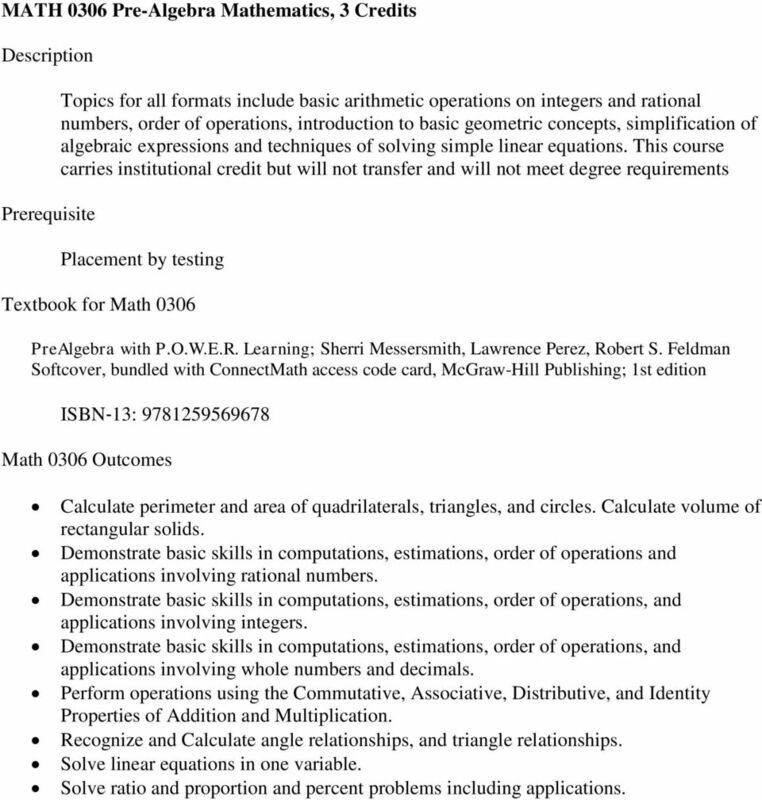 MATH 0306 or placement by testing Textbook for Math 0308 and Math 0310 Introductory Algebra with P.O.W.E.R. Learning; Sherri Messersmith, Lawrence Perez, Robert S. Feldman Softcover, bundled with ConnectMath access code card, McGraw-Hill Publishing; 1 st edition ISBN 13: Math 0308 Outcomes Add, subtract, multiply, and divide polynomials. Factor polynomials. Simplify, multiply and divide rational expressions. Simplify expressions using definitions and laws of integer exponents. Sketch graphs of linear relations and determine a linear equation in two variables given pertinent information. Solve linear equations and inequalities in one variable and compound inequalities in one variable. Solve quadratic equations using the factoring method. Solve systems of linear equations in two variables, including applications. Use linear equations to solve applications. Find the slope and x and y- intercepts of a linear relation. 5 Math 0308 Sections 1.3 Geometry Review 2.1 Solving Linear Equations Part I 2.2 Solving Linear Equations Part II 2.3 Solving Linear Equations Part III 2.4 Applications of Linear Equations 2.5* Geometry Applications and Solving Formulas 2.8 Solving Linear Inequalities in One Variable 3.1 Introduction to Linear Equations in Two Variables 3.2 Graphing by Plotting Points and Finding Intercepts 3.3 The Slope of a Line 3.4 The Slope-Intercept Form of a Line 3.5 Writing an Equation of a Line 4.1 Solving Systems by Graphing 4.2 Solving Systems by the Substitution Method 4.3 Solving Systems by the Elimination Method 4.4 Applications of Systems of Two Equations 5.1 (Parts A and B) Basic Rules of Exponents 5.2 (Parts A and B) Integer Exponents 5.3 The Quotient Rule 5.4 Scientific Notation 6.1 Addition and Subtraction of Polynomials 6.2 Multiplication of Polynomials 6.3 Dividing a Polynomial by a Monomial 6.4 Dividing a Polynomial by a Polynomial 7.1 The Greatest Common Factor and Factoring by Grouping 7.2 Factoring Trinomials of the Form x 2 + bx + c 7.3 Factoring Trinomials of the Form ax 2 + bx + c 7.4 Factoring Special Trinomials and Binomials 7.5 Solving Quadratic Equations by Factoring 7.6 Applications of Quadratic Equations 8.1 Simplifying Rational Expressions 8.2 Multiplying and Dividing Rational Expressions NOTE: Geometry Sections are review sections only (Choose from Section 1.3 and Section 2.5). 6 MATH 0309 Foundations of Mathematical Reasoning, 3 Credits Prerequisite Corequisite This course surveys a variety of mathematical topics needed to prepare students for college level statistics or quantitative reasoning or for algebra-based courses. Topics include: numeracy with an emphasis on estimation and fluency with large numbers; evaluating expressions and formulas; rates, ratios, and proportions; percentages; solving equations; linear models; data interpretations including graphs and tables; verbal, algebraic and graphical representations of functions; exponential models. This course carries institutional credit but will not transfer and will not be used to meet degree requirements. MATH 0306 or placement by testing. EDUC 1300 Math 0309 Outcomes Students will develop number sense and the ability to apply concepts of numeracy to investigate and describe quantitative relationships and solve real-world problems in a variety of contexts. Students will use proportional reasoning to solve problems that require ratios, rates, proportions, and scaling. Students will transition from specific and numeric reasoning to general and abstract reasoning using the language and structure of algebra to investigate, represent, and solve problems. Students will understand and critically evaluate statements that appear in the popular media (especially in presenting medical information) involving risk and arguments based on probability. Students will understand, interpret, and make decisions based on financial information commonly presented to consumers. Students will understand that quantitative information presented in the media and by other entities can sometimes be useful and sometimes be misleading. 7 MATH 0310 Intermediate Algebra, 3 Credits Topics for all formats include special products and factoring, rational expressions and equations, rational exponents, radicals, radical equations, quadratic equations, absolute value equations and inequalities, complex numbers, equations of lines, an introduction to the function concept, and graphing. This course carries institutional credit but will not transfer and will not be used to meet degree requirements. 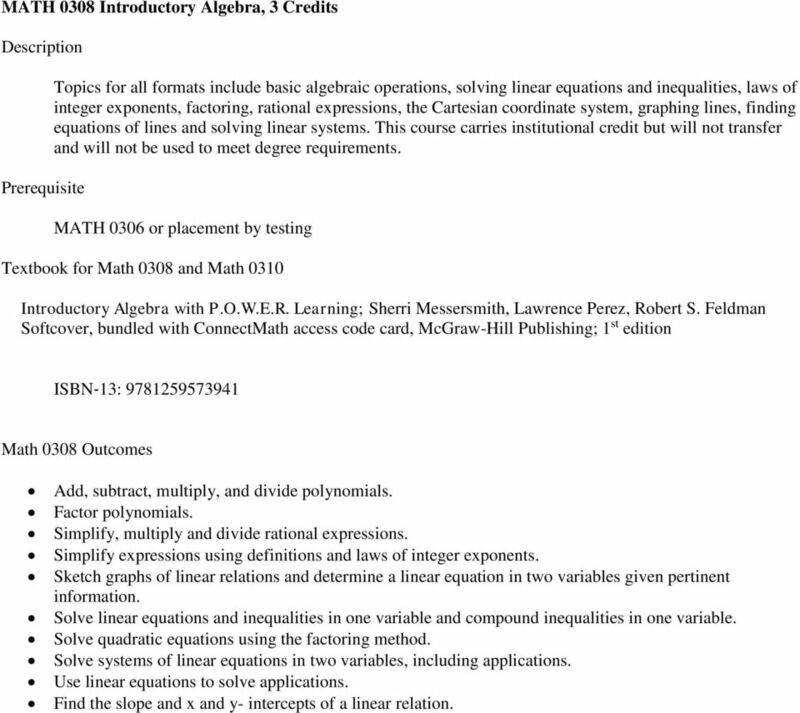 Prerequisite: MATH 0308 or placement by testing Textbook for Math 0308 and 0310 Introductory Algebra with P.O.W.E.R. 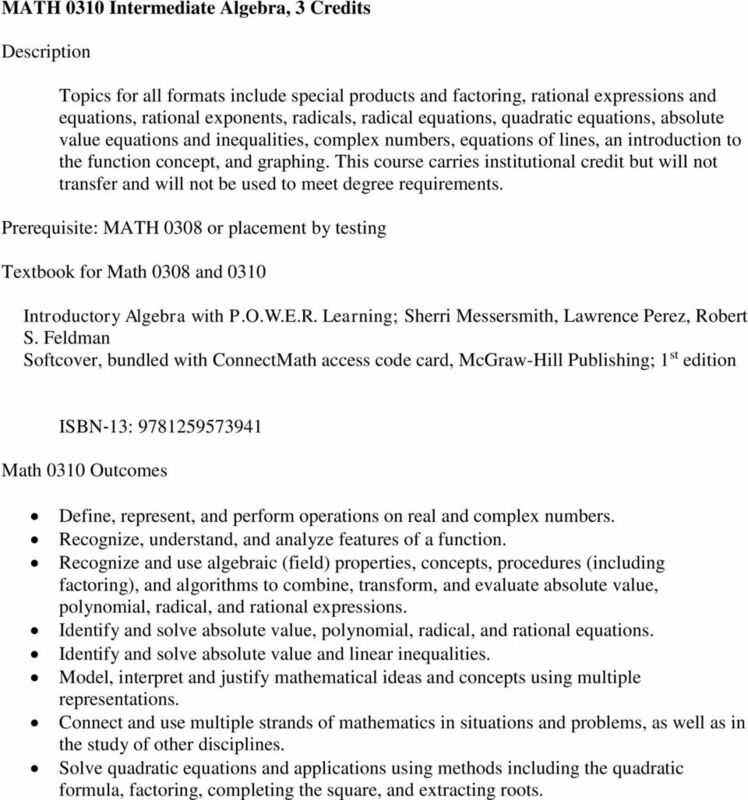 Learning; Sherri Messersmith, Lawrence Perez, Robert S. Feldman Softcover, bundled with ConnectMath access code card, McGraw-Hill Publishing; 1 st edition ISBN 13: Math 0310 Outcomes Define, represent, and perform operations on real and complex numbers. Recognize, understand, and analyze features of a function. Recognize and use algebraic (field) properties, concepts, procedures (including factoring), and algorithms to combine, transform, and evaluate absolute value, polynomial, radical, and rational expressions. Identify and solve absolute value, polynomial, radical, and rational equations. Identify and solve absolute value and linear inequalities. Model, interpret and justify mathematical ideas and concepts using multiple representations. Connect and use multiple strands of mathematics in situations and problems, as well as in the study of other disciplines. Solve quadratic equations and applications using methods including the quadratic formula, factoring, completing the square, and extracting roots. The program also provides supplemental modules on topics in geometry and probability and statistics. 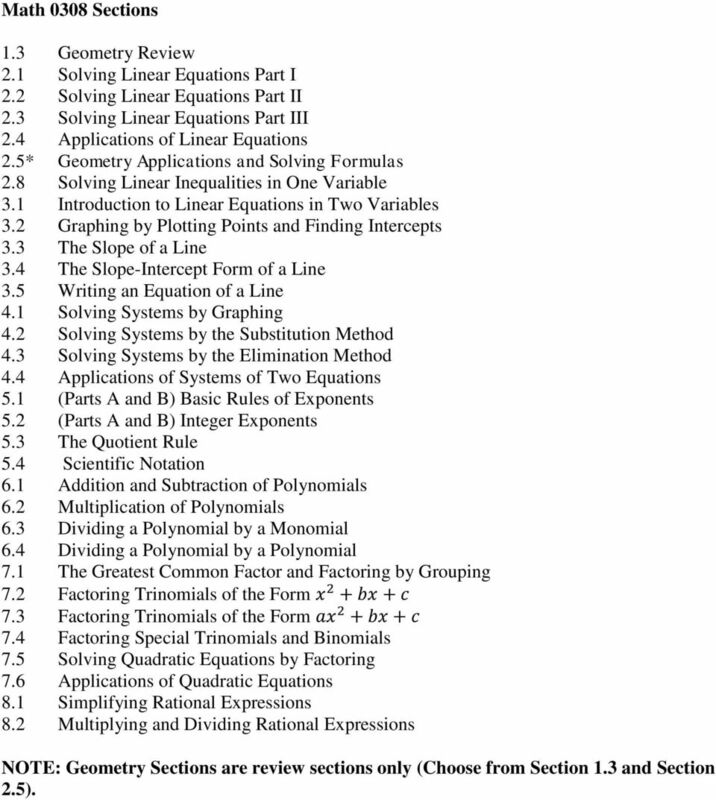 Algebra 1, Quarter 4, Unit 4.1 Polynomial Operations and Factoring Overview Number of instructional days: 15 (1 day = 45 60 minutes) Content to be learned Identify terms, coefficients, and degree of polynomials. Suggested Sequence: CONCEPT MAP ALGEBRA I / ALGEBRA I SUPPORT August 2011 1. Foundations for Algebra 2. Solving Equations 3. Solving Inequalities 4. An Introduction to Functions 5. Linear Functions 6. MATH BOOK OF PROBLEMS SERIES. New from Pearson Custom Publishing!